Okay, here is some back ground. I am in a Foodie Pen Pal Program and I also order Foodie Boxes. I love to try new things, especially if they focus on health and wellness. The Conscious box focuses on sustainability, environmental stewardship, and social responsibility. I love it. I thought I would try it for a few months, but found myself renewing the subscription for an additional 3 months. I think I’m hooked. So in December I received my Vegan Conscious box. The items in the box were selected by the Vegan Zombie! Favorite Box EVER, partly because I am obsessed with Zombie’s and all things Zombie Related. This is the postcard for the Zombie Crew. So much good stuff. This box had a huge variety of food and snack items, along with hb&a items and household items. I also ordered myself the December Original Conscious box! They offered a one time purchase for the holidays, and I was all over it. Merry Christmas to ME! Before I could even break into the December boxes, I received my January Vegan Conscious box. Each month they stuff the box with so many new products and fun things to try and sample. Looks like I am going to have to get serious about some snacks. I just saw on Facebook that the Conscious box now offers a box of gluten-free items! This is my one indulgent to myself each month. I don’t buy shoes or purses, I order monthly foodie/health conscious subscriptions. I think its great that the folks over at Conscious Box offer an original box, a vegan box and now a gluten-free box. They sure do meet everyone’s needs. Well, I’m off to sort through my goodies….For anyone that is as Zombie Obsessed as me, F.Y.I. 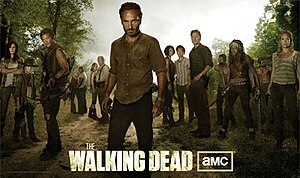 : The Walking Dead’s season resumes on February 10th. Now that is one show I am beyond obsessed with. My favorite subscription is the Conscious Box. I ordered this 3 months ago and thought I’d try it and see if it was something I wanted to purchase long-term. Well after the 1st. month I was hooked, and renewed my subscription for 3 more months. Loving it! This was my haul from the October’s Box. This box is just packed with such good stuff. I love trying new products and trying new foods, so this box service is perfect. I like to make my own kale chips, but these were dehydrated and were simply delicious. I loved the flavor, it was smokey and rich. My furry kids just loved these V-Dog nuggets. Stuart giving them a try. Killian coming back for more. One bite left for each. Now this is one bar I have been really wanting to try. I have seen them on many blogs and loved the concept behind the bars. You can read the concept behind the Barre Bar here. Reusable bamboo towel. Love it and use it in my kitchen. Love that it can be used, reused and used again. There was also some skin lotions, dog shampoo and a few other sample packets in the box, but sadly I used them before I took a picture, but you get the idea…Conscious Box rules! Oh yeah and some chocolate that just did not stand a chance. On a sad note, its with a heavy heart that I have to tell you that my little red dog Killian is no longer with us, he died on November 26, 2012. He was diagnosed with diabetes at the end of October, and we were giving him insulin shots twice a day hoping to get it under control, but sadly he ended up getting a blood infection due to his pancreas not working properly. We had an amazing Thanksgiving with Killian, my parents and their dog Charlie all came over and we had a wonderful holiday, at this time we thought we were going in the right direction with him, and that he was improving, but just a few days later he declined fast. I held him as he left this world, with Stuart by his side. Words cannot describe what this precious life meant to us. He lived 14 years, I am thankful for that, but I’m greedy and I wanted more. If there is one thing I can say about Killian, it’s this: He Lived Life Well. He loved every second of everyday. He was my special boy and I will carry him in my heart for all the days of my life. Killian Michael, Rest in Peace. One thing that I am so thankful for is taking a family picture on Thanksgiving. Each day since Killian has passed I have given thanks for his life and how he touched our lives with his humor and his never-ending love.